There is nothing better than going on a shopping trip and Bridges offers two regular shopping buses for your weekly shopping. This program could not operate without our volunteer John, who both organises the program and drives the bus. 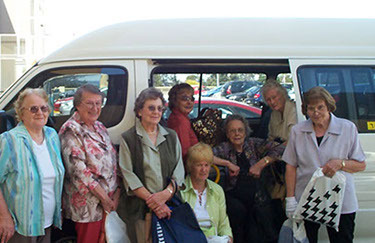 The Bridges Community Shopping Bus operates on a Wednesday, picking up our clients from their homes and taking them to either Knox City Shopping Centre or Stud Park. The Hills Community Shopping Bus (Belgrave, Tecoma and Upwey) operates on a Thursday. The Bridges bus arrives at the shopping centres at 11:00am and leaves at 1:00pm, giving you a couple of hours of unassisted shopping. The Hills bus leaves at 1:30pm.The cost of this service is $8.00 for a return trip. Wheelie walkers can be taken on the minibus. Bookings are essential and can be made by contacting our office by phone 9763 9700.